Radios are so 1950s. Well, until you have an emergency, your phone battery dies and you have no idea what’s going on in the greater world. Then you’re going to be wishing for a little AM/FM love. 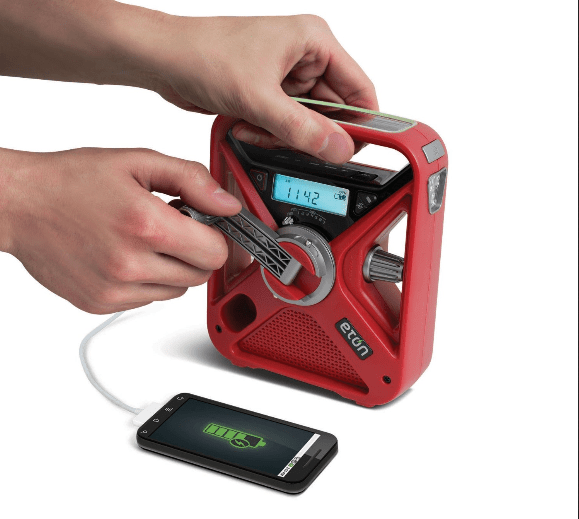 The Red Cross FRX3 Eton Emergency Radio takes it to the next level. This rechargeable emergency radio is chock full of little extras that makes it an awesome addition to any household in an area that’s prone to nasty acts of nature. It has the standard AM/FM radio but it also broadcasts weather alerts automatically and features WB digital radio. It comes equipped with an internal rechargeable battery but also has an AAA option. There’s a solar panel and a hand crank so this puppy never has any excuse to stay down for long. It also comes with a mini-USB cable meaning it’s ready help you charge your phone or other mobile device. It’s designed for emergencies but it would be a great addition to camping gear or to just keep in your car, after all, you never know when things might go wrong. It’s currently priced at $60.